Internet radio is not dead yet. Well, that's the situation in America at the moment after Congress passed a bill that has given online broadcasters and music label execs more time to sort out their differences. Give it five months and it could be a very different story. The Webcaster Settlement Act Of 2008 certainly sounds like a bill that has sorted out the legal problems webcasters face by streaming music but, according to Ars Technica, it hasn't – merely delayed the inevitable. The problem is that no deal has been settled, with both parties still in discussion about who should get what when it comes to the money side of internet radio. 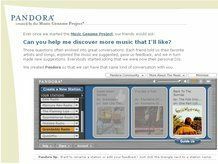 Just last month, the creator of Pandora – one the most well-known online radio stations – announced that if something isn't sorted out soon, then the website will have to close. And if this happens, some of the lesser known music-streaming sites will surely follow. The actual extension is until next February. So, that gives everyone just five months to sort themselves out. Unsurprisingly, it's not just record labels who are fighting against the internet radio sites but non-web radio broadcasters too. Radio owners, such as Clear Channel, have been actively trying to kill the bill and get rid of their web brethren.